The tube is called Steampunk_Christmas Rooster. Paste paper 17, apply your mask, delete, merge group. Paste frame 5, click inside with your magic wand, expand by 5, paste paper 17, invert, delete, move below the frame, then paste the cityscape, delete, select none. Resize your rooster tube to 30%, paste on top of the frame layer on the left side. 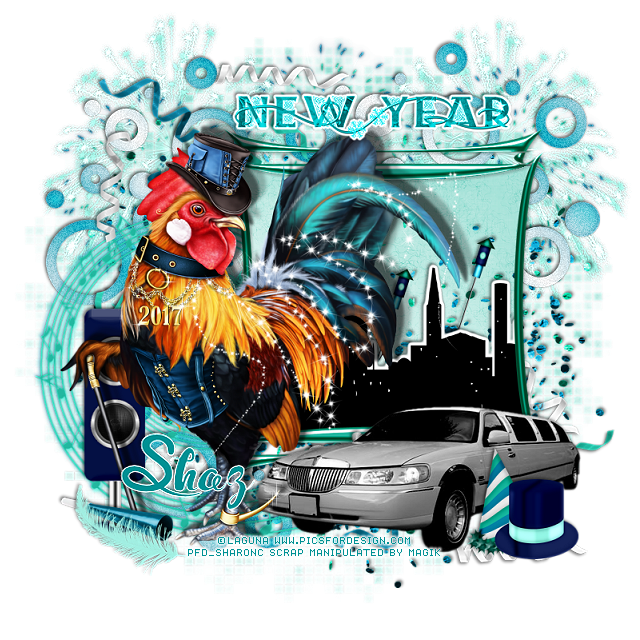 Paste the limo on the right below the rooster layer. Paste the fireworks on one side below the paper layer of the frame, duplicate, mirror. Paste the firework sparkles below the paper layer of the frame, duplicate, mirror, adjust to your liking. Paste the confetti below the paper layer of the frame on the left, duplicate, mirror, duplicate again, move down and to the left a bit under the limo and rooster more. Paste the doodles in the upper left below the paper layer of the frame, duplicate, move over to the right and down slightly, duplicate again, move down to the bottom area. Resize the speaker to 70%, place on the left below the rooster. Paste the note swirl below the paper layer of the frame on the left. Resize the deco to 35%, place by the limo. Paste confetti 2 at the top, duplicate, flip, move to the right side, both being below the paper layer of the frame. Resize the blow horn to 35%, place by the speaker on the left. Resize the feather to 30%, free rotate to the left, place by the blow horn. Resize the bottle rocket to 35%, duplicate, paste on the paper layer of the frame how you like. Paste sparkle 2 on the rooster.